Photo from Home Directory of the Colored People of Chester, 1906 compiled by Lawrence L. Barrett & C. I. Wilson. The photographs in the book were taken by Mr. H. E. Williams, 210 E Broad St., Chester. History The following brief History of Union A.M.E. Church is taken from the Home Directory of the Colored People of Chester, 1906 compiled by Lawrence L. Barrett & C. I. Wilson. This reference is available at the DCHS research library. "Early in this century Robert Morris, a slave in the lower part of Delaware, was told by his master, with whom he was a favorite, that his property was about to be levied on by the Sheriff, to make his escape to Chester and, if possible, get some one to buy him. The latter fled, and Charles Lloyd, of the Blue Bell Tavern, Kingsessing, purchased him from his master for $300, conditioned that when he attained 30 years he was to be free. "Morris, who was a religious man, after he was free, came to Chester, where he organized this church. 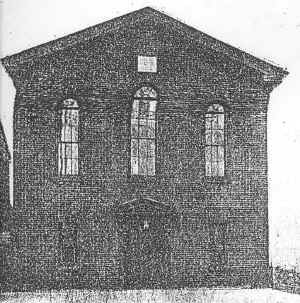 "At first only four persons could be found to attend meetings, which were held in a house occupied by a man named Williams, on Third street, west of Concord avenue, but by degrees the movement spread until about 1831, when sufficient means were collected to purchase from Matthew L. Bevans a lot on Welsh street, and to build a frame church. "The following year Rev. Samuel Smith was appointed local preacher, and continued in charge until 1837. His pastorate, however, was financially unsuccessful, inasmuch as the expenses of the organization created a burdensome debt, so that Robert Morris once more came to Chester to its assistance, and Rev. Benjamin Jefferson was assigned as its pastor, in which capacity he continued until 1874. The latter strove energetically to liquidate the encumbrance, and succeeded in clearing the church of debt. He was followed in 1875 by Rev. Lorenzo D. Blackston, and the following year Rev. Henry Mode was appointed pastor. Again, in 1877, Rev. Benjamin Jefferson was assigned to the charge of the church, and continued until 1880. It was during his second pastorate that the edifice was rebuilt as it is today, although many years before a stone building had taken the place of the original frame structure. From 1880 to 1881, Rev. Lewis J. Jones was in charge. In the latter year Rev. Francis H. Norton, the present pastor, was appointed. Union Church, and is now a flourishing body, while the membership of the parent church has largely increased." -From Historical Sketch of Chester by Henry Graham Ashmead, published 1883. STEWARDS- E. Durnell, J. Crisden, William Bordley, Hiram Griffin, Charles White, Samuel Dutton, Mary Dickerson. TRUSTEES- Joseph Robinson, H. L. Driver, William Dennis, George Dellam, Joseph Lockman, Henry Morgan, Samuel Foster. DAUGHTERS OF CONFERENCE- Emma Williams, President. MITE: MISSIONARY--M. E. Coombs, President. � 2003 John A. Bullock III.